On Thursday, Dec. 22nd, I met Heather Frost, author of the YA book Seers (Oct. 2011), first in a trilogy from Cedar Fort's imprint, Sweetwater Books. The Seers cover is pink themed (take off the dust jacket and the hardbound cover looks like bubblegum!) and Heather said that the second book, Demons, hoefully due out next year, should be a lime green theme. So looking forward to it! Heather was super nice and even gave out mood rings for every book she signed! (The main character, Kate Bennett, can see "mood auras".) Check out Heather's blog here, and the Seers page here. 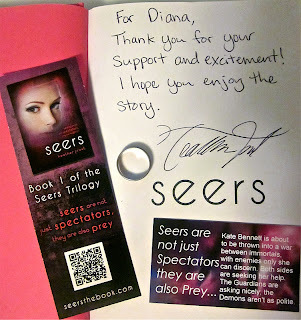 There's even a giveaway for a copy of Seers on Goodreads!